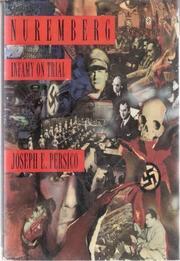  Most books about the Nuremberg trials have focused on the jurisprudential aspects of this unprecedented event. Persico (Casey, 1990; Edward R. Murrow, 1988; etc.) has chosen to write an overview that offers a picture of the comparatively underreported battles behind the judgments. Persico traces the history of the war crimes tribunal, from the waning days of the war, when Churchill was calling for drumhead court-martials and summary executions. Truman wanted a legal proceeding that would show the world that Nazi barbarism was the exception, not the rule, and would make an example of the most heinous perpetrators. But would the result be victors' justice or the real thing? Throughout the several months from the time the idea was hatched to the execution of sentence, there raged a series of behind-the-scenes struggles. Within the prosecution, there were turf wars over who would take the lead in examining witnesses, over which of the four participating powers--the US, Great Britain, France, and the Soviet Union--would carry the most weight, and over genuine differences of opinion as to what kind of prosecution would be most effective. Among the defendants, there were numerous factions, with the supremely cynical anad evil Reichsmarshal Hermann Goering emerging as a dominant figure. Drawing on interviews with many participants who have never spoken of their experiences for publication, Persico delineates the personal clashes (Supreme Court Justice Robert Jackson, the head of the US prosecution team, vs. former attorney general Francis Biddle, the US judge; a duel between the prison psychiatrist and psychologist over who would publish a book first), often at the expense of the courtroom action. Gradually the focus on the out-of-sight nastiness among the Allies becomes numbing and unpleasant, and the book is most lively when it shifts its attention back to the proceedings themselves. Nuremberg has an undeniable timeliness, especially in light of the new wave of Holocaust deniers. Persico writes well, despite occasionally drifting into melodrama, and the subject exerts its own fascination.